On June 12, 2016, Omar Mateen killed 49 people and wounded as many more at a gay club in Orlando — the deadliest mass shooting in American history. The massacre reignited a now long-standing debate over whether civilians have any business owning “military-style” guns such as Mateen’s SIG Sauer MCX rifle. “Turns out I don’t need a story. The AR-15 is on display in the window of the gun shop,” she added. Still, Ubiñas, Kuntzman — along with many others on both sides of the argument — left out an important point. Gun-makers have sold variants and derivatives of the AR-15 rifle — such as the MCX — to civilians for more than 50 years. In this particular case, terminology is important. “AR-15” is a trade name, but one such as “Kleenex” or “Xerox.” It has entered the common lexicon to describe a broad category of weapons based around the same pattern. Originally meaning “Armalite Rifle 15,” after the original manufacturer, the letters have come to simply represent “automatic rifle” in many people’s minds. With Armalite’s patents long-expired, any company can make AR-15 clones — and they do. Regardless, both the news media and gun owners commonly refer to hundreds of different variants based on the initial Armalite design simply as “AR-15s,” regardless of a design’s origins or particulars. Swiss-owned SIG Sauer’s American subsidiary produces the MCX. It shares with other AR-15 derivatives a common lower frame, the part federal law treats as the central element of this broad group of firearms. If you own an AR-15 lower receiver, you own a gun, as far as authorities in Washington are concerned. With a company-supplied conversion kit, anyone can convert existing AR-15 rifles into MCXs in the privacy of their own home — without needing to be a trained gunsmith, a licensed gun-dealer or a federally-approved manufacturer. Though ubiquitous today, the Armalite’s lightweight rifle could easily have failed. In 1957, the company had rushed a prototype of an earlier, larger gun to the U.S. Army, in hope of securing a major contract. During a torture-test at Springfield Armory, the barrel on this experimental AR-10 broke open. Already lobbying hard for their own design, the M-14, the Army’s weaponeers cited the AR-10 incident to help quickly dismiss the rival gun as a viable alternative. The California gun-manufacturer, then still a division of the Fairchild Engine and Airplane Corporation, went back to the drawing board. Legendary gun-designer Eugene Stoner and his team scaled-down the rifle. The new AR-15 was a marvel of then-state-of-the-art manufacturing processes and materials. Armalite made the AR-10s and -15s from lightweight aluminum and fiberglass, a break from the wood-and-steel guns of the recent past. The AR-15 weighs less than eight pounds with a fully loaded 30 round magazine. By comparison, through World War II and Korea, American soldiers lugged the nine-and-a-half-pound M-1 rifle, which held only eight rounds. The M-1 fired single shots. Armalite’s gun could fire individual rounds or spit out more than 12 rounds per second on fully automatic. The AR-15 functions by sending some of the gas that propels the bullet down the barrel back through a pipe to force the main mechanism to open, eject the empty cartridge case and get another round ready to fire. Critics of this design complain that particles in the gas can build up in the gas tube and elsewhere and jam up the gun. Like a number of newer AR-15 clones, the MCX’s cycle moves the action with a physical piston, keeping the gas out of the central parts of the rifle. Most notably, the gun’s small, .22-caliber cartridge weighed less than did the Army’s older .30-caliber rounds or the 7.62-millimeter ones it adopted afterwards. With the AR-15, troops could carry more ammunition. The new gun didn’t kick nearly as badly as older weapons did. At the time, the Pentagon was becoming increasingly interested in the possibility that troops might shoot more accurately under the stress of combat with smaller bullets or even tiny darts. The Army was running dozens of experiments on new projectiles — and weapons to go with them. So a year after the Army rejected the AR-10, Armalite sent the new AR-15 to the ground combat branch for more tests. The response was favorable. “The United States Army Infantry Board recommends that … [t]he Armalite (AR-15) rifle be considered a potential replacement for the M–14,” a 1958 report explained. Still, having just picked up the M-14, the service wasn’t rushing to buy any new rifles. Still, after failing twice to get a U.S. government contract, Armalite clearly worried about finding potential buyers. The company had sold only small numbers of AR-10s to small countries such as Portugal and Sudan. Larger potential sales to Germany and the Netherlands ultimately fell through. So Armalite sold the rights to both the AR-10 and AR-15 to Colt Firearms, and moved on. Colt continued aggressively marketing the guns to the Pentagon — and to anyone else they could think of. By exploiting his personal connections, Colt representative Robert Macdonald did manage to grab the interest of the U.S. Air Force by showing off the AR-15 to Gen. Curtis LeMay at a birthday party for Fairchild’s ex-president Richard Boutelle in July 1960. Macdonald sold LeMay on the guns by letting the cigar-chewing officer blast watermelons in Boutelle’s backyard. Then in charge of the flying branch’s nuclear bombers, LeMay pushed for the Air Force to buy the rifles for the airmen guarding his planes. The Air Force became the first major customer for the firearms. But five years after the first AR-10 tests, the Army was still ambivalent on the new rifles. Secretary of Defense Robert McNamara, a technocrat, was more interested in a program to cook up a space-age dart gun coupled with a grenade launcher. McNamara was impressed by the AR-15, but only as a stopgap until the wonder weapons were ready for combat. So, as the Pentagon and the Army dithered, Colt went in a different direction … and pitched the guns to private shooters. In 1963, advertisements started popping up in magazines such as Guns. Unlike their military counterparts, these guns could only fire single shots. Otherwise, they were functionally the same weapons. The AR-15 Sporter would set you back just shy of $190 — around $1,485 in 2016. It’s not entirely clear if anyone at the time thought the AR-15 would sell well on the civilian market. On May 24, HBO’s Real Sports aired an interview with Jim Sullivan, a former Armalite engineer who worked with Stoner on the original AR-15. In the now-controversial segment, Sullivan appeared to suggest the rifle had never been intended for the private market. In addition, Sullivan refuted the assertion that the gun’s .22-caliber bullet is particularly deadly. Still, his clarification again left out any mention of Colt’s early efforts to tap the private market. But Colt’s decision was not entirely surprising. While the technology behind the AR-15 was a far cry from Revolutionary War muskets or Civil War rifles, the idea of owning a “military-style” firearm was hardly odd, even after World War II. Historically, private citizens had owned guns similar or identical to military types, simply because that was what was available. War was often the driving factor behind innovative firearms designs, anyway. At the same time, Colt and McNarama were finally starting to win over the Army. The ground combat branch was considering a version of the gun for its still relatively new Special Forces troops, as well as airborne soldiers and anyone who might need a lightweight rifle. McNamara’s super rifle never materialized. By 1966, both the Army and Marine Corps decided to issue M-16s to all troops heading to Vietnam, opening the door for the gun to become the military’s standard firearm. As it turned out, despite Colt’s marketing blitz, the Connecticut gun-maker was completely unprepared for this success — and couldn’t keep up with demand. The Pentagon had to hire Harrington & Richardson and General Motor’s Hydramatic Division to help out. Despite the M-16’s controversial performance early in the Vietnam War, the gun became iconic of that conflict. Updated versions are still the standard infantry weapon for American troops. And despite of Colt’s production problems, this popularity was reflected in the civilian market. As time went on, the firm incorporated many of the same improvements that it offered the Pentagon into the civilian versions of the weapon. 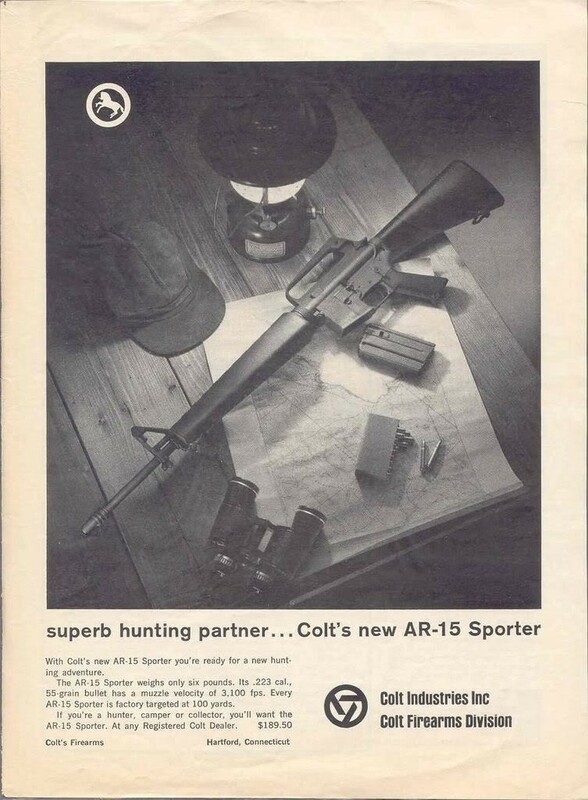 In 1969, Colt first tried selling to the Pentagon and private buyers a piston-operated AR-15 akin to SIG Sauer’s MCX. At the time, no one was interested — and the company quickly dropped the variant. By 1985, Colt had produced more than 200,000 SP-1s. As suggested in the company’s first advertisements, private citizens bought the guns for competition shooting, hunting, self-defense and simple novelty. After the company’s exclusive rights to the design expired, gun-makers big and small jumped on the AR-15 bandwagon. Dozens of other manufacturers now make a plethora of versions with a host of different features, each under their own specific names. As public perception and gun laws changed, so did the rifles themselves. Colt eventually added new features to make it difficult to convert an AR-15 to fire on full automatic without significant work. Under the 1994 assault-weapons ban, AR-15-makers had to remove certain features — such as a place to attach a bayonet or a flash hider at the end of the barrel. But the basic design went essentially unchanged in most cases. On top of that, the legislation grandfathered-in older guns, which commanded a premium on the private market before the law expired a decade later. AR-15s never left the civilian marketplace. Unfortunately, the popularity and ubiquity of AR-15s increasingly made them a central feature in mass shootings. On July 20, 2012, James Holmes killed 12 people and injured 70 at a movie theater in Aurora, Colorado. He wielded a Smith and Wesson M&P15. Fewer than six months later, Adam Lanza murdered more than two dozen people — including 20 children — at an elementary school in Newtown, Connecticut. His weapon was a Bushmaster XM-15. In December 2014, victims’ families filed a civil lawsuit against Bushmaster and its parent company Remington. Despite the bad press, as Ubiñas and Kuntzman found, the rifles are still selling strong after five decades.